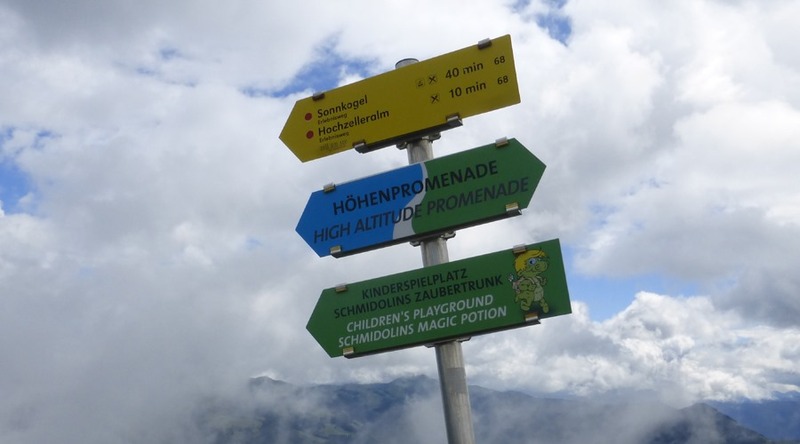 It was the last day of my holiday in Austria and I wanted to do another high level walk on the Schmittenhohe. However the weather was not promising. It had gone cooler and the forecast was for rain in the afternoon. I set out in shorts and T-shirt carrying a light fleece and rode up the mountain in the cable car. 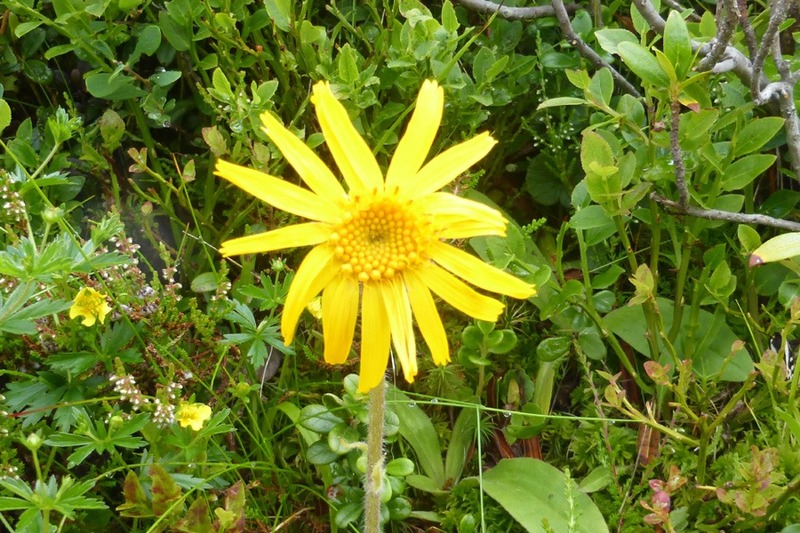 When I reached the summit at 1965 metres I was in for a shock. A digital temperature display was showing 2 degrees. It’s a good job I brought my fleece. I now had to decide what to do. I would love to walk the Pinzgauer Spaziergang. 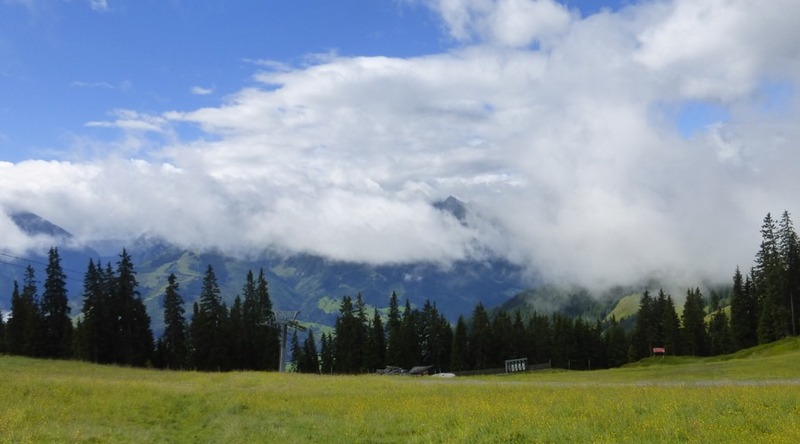 An 17.1 km high level walk along route 719 taking in several peaks over 2000 metres. 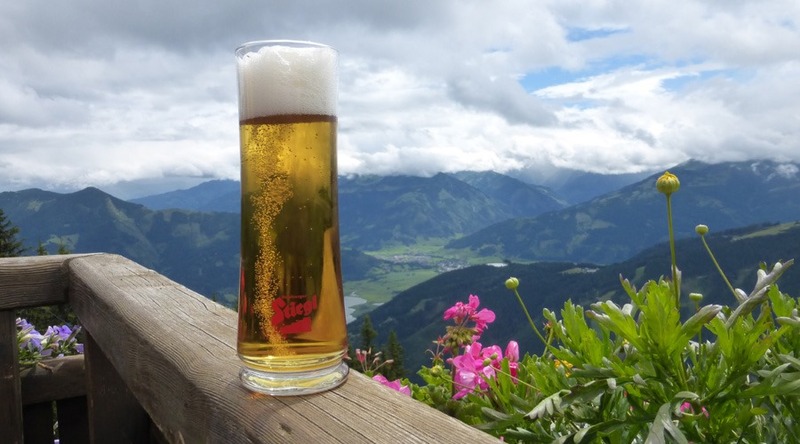 You are advised to allow a minimum of 6 hours walking time and the last cable car down on the Schattberg X-Press leaves at 4.15 pm. Maybe not today and not on my own. The first section looked lovely. A green path flanked by flowers. Perhaps I could go a little way! I walked down to the first dip and then it was decision time. 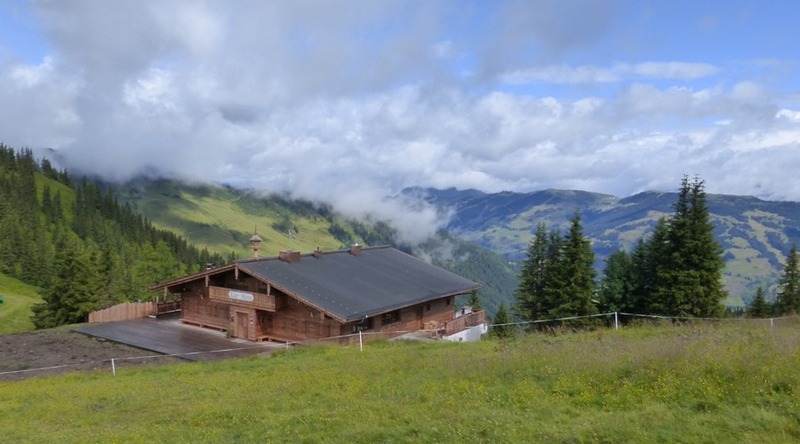 The Pinzgauer Hutte was only another 25 minutes and perhaps I could get a hot drink. The weather also seemed to be improving. I set off along the track but I was soon enclosed in forest. I was also losing height. 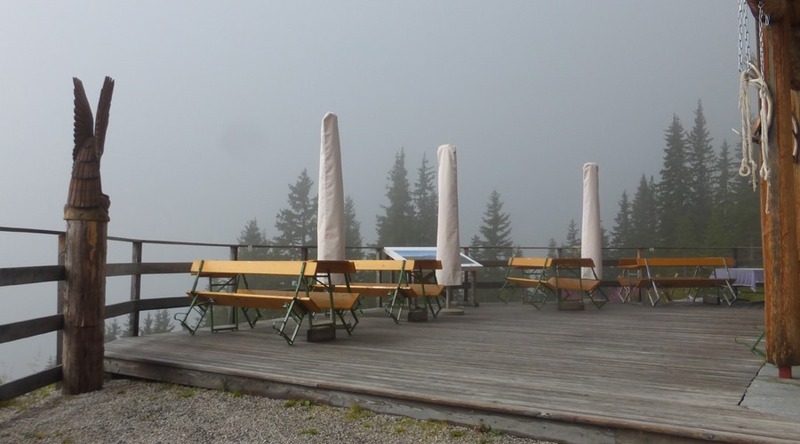 When I reached the Pinzgauer Hutte it was closed and there were no views. I was in the cloud. 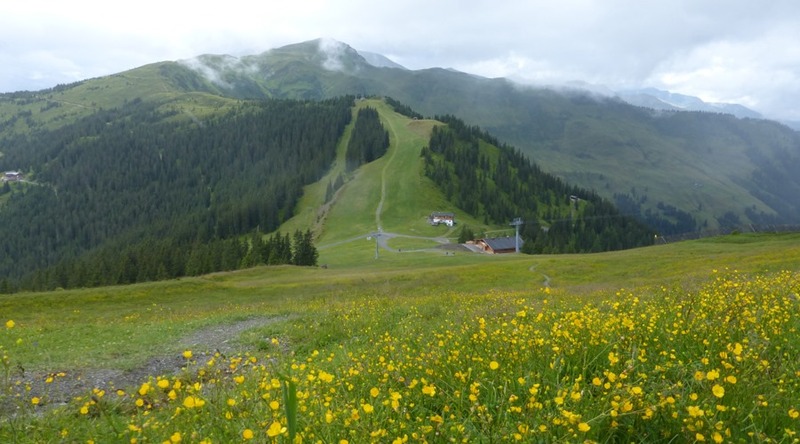 I had lost almost 300 metres in height and the 45 minute climb back to the summit of the Schmittenhohe seemed hard. Even at this modest height I was having to work hard, but at least I was now warm. The skies were brightening and I saw some Aconite along the way. I did not go back to the summit but turned off to follow Sisi’s Rundweg that I had walked the previous week. 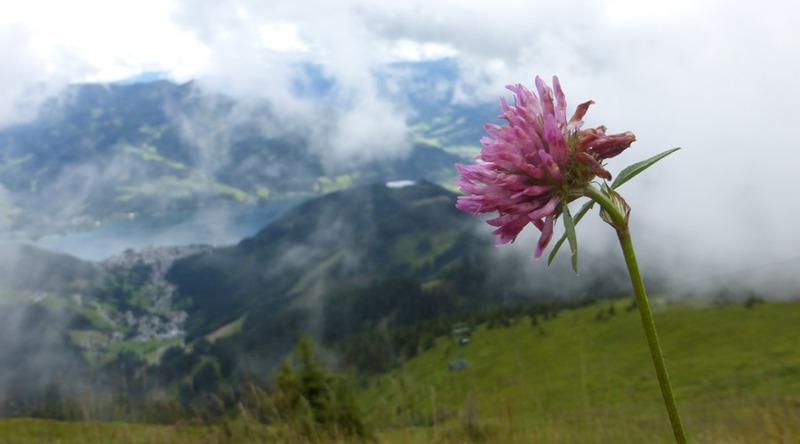 It gave me the chance to see more wild flowers and look down to Zeller See. 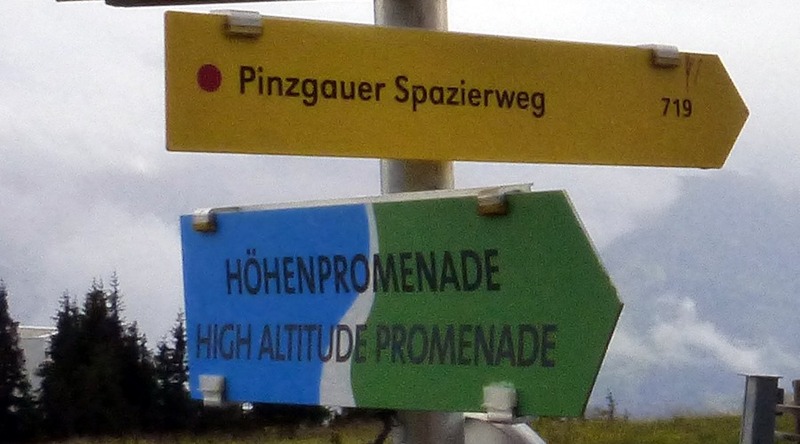 I joined the High Altitude Promenade and headed towards Sonnkogel. 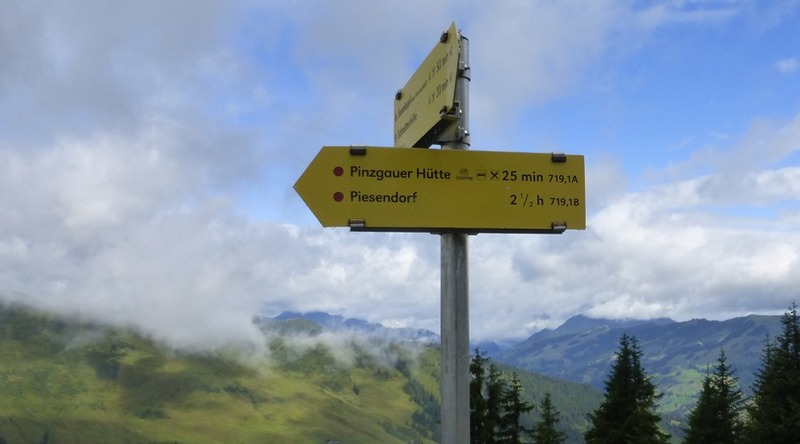 At a junction I took the left fork to climb up Salersbachkopfl following route 67. 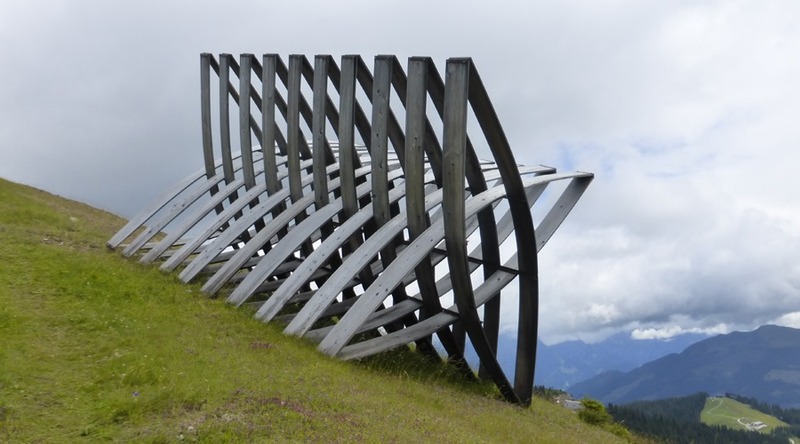 I wanted to see a couple of the Art on the Mountain sculptures. I call it ‘The High Table’ but its name is Gruss Gott, Nehmt Platz Oder Kommunikation 2000. Designed by Michael Printschler. The next sculpture is called Schneefalle. 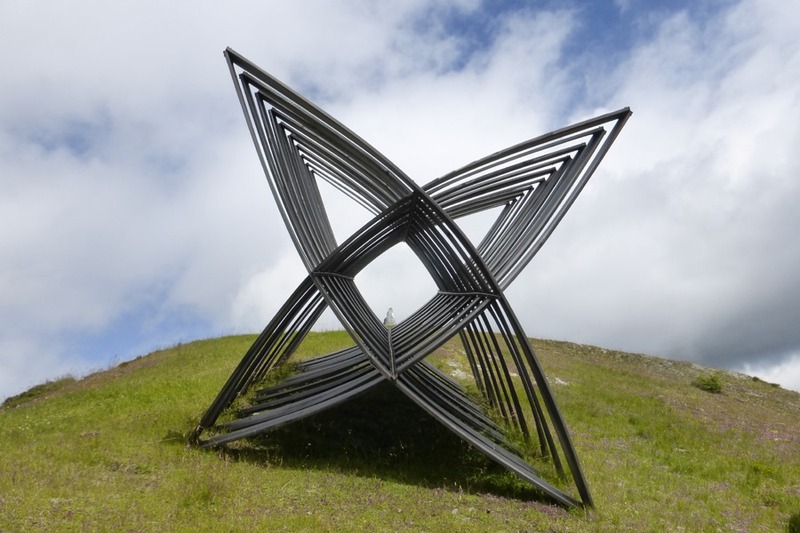 The sculpture is partially defined and designed by the overall space surrounding it. it is through this relationship that it becomes an integral part of reality, proffering itself as a kind of challenge. 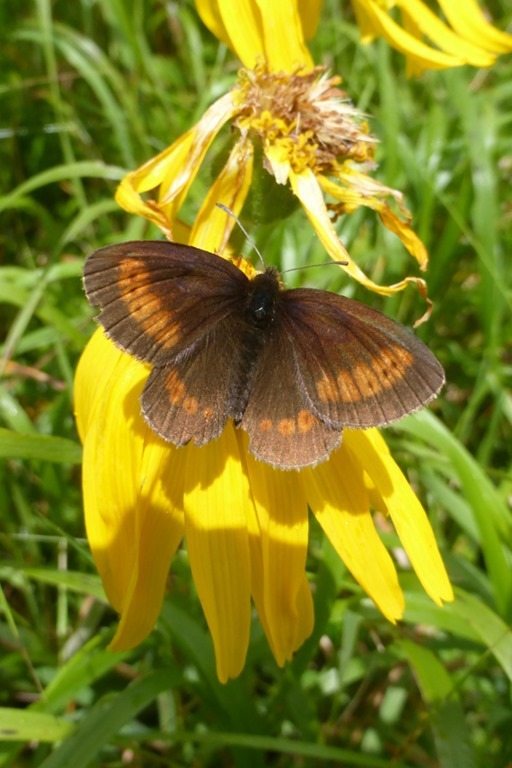 When movement occurs within this space, it reacts, changes its form. Yet it can also reflect what people feel as tranquillity and peace. 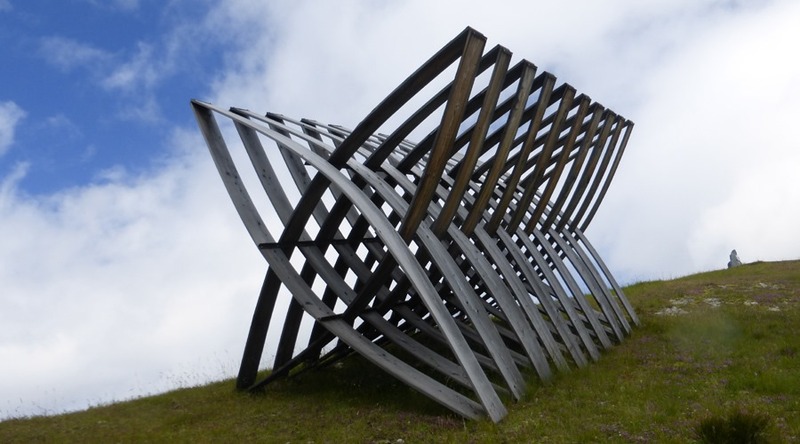 Thus, the sculpture bears witness to the on-going conditions around it. It was designed by Herbert Golser in 1998. 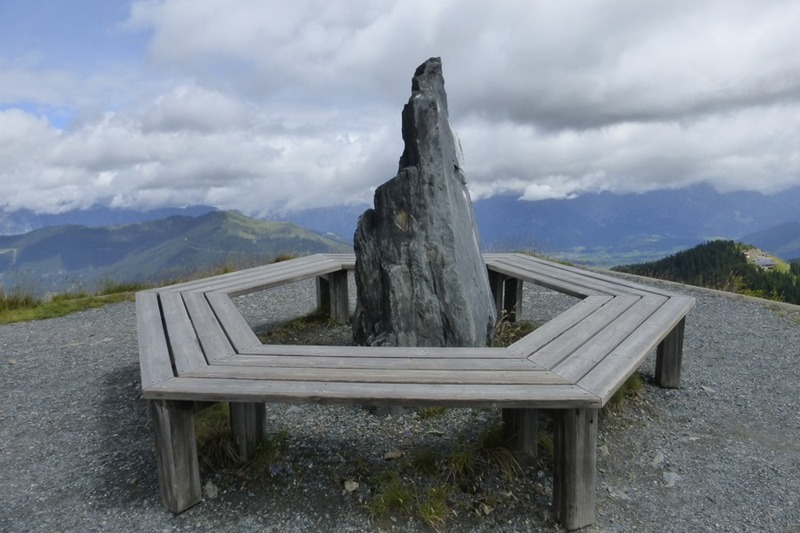 Behind it and acting like a sight was the stone pillar at the summit of Salersbachkopfl. I dropped down to the main path and followed it towards Sonnkogel at 1856 metres. 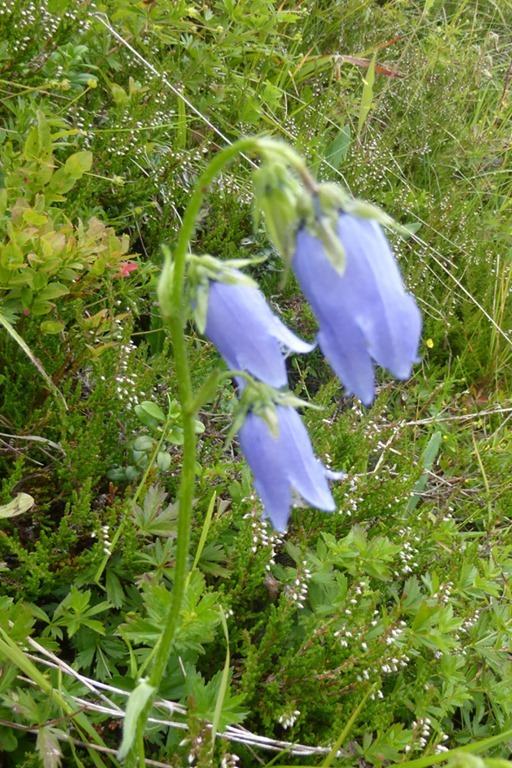 Along the way I paused to take photos of Bearded Bellflower and a butterfly on Aconite. 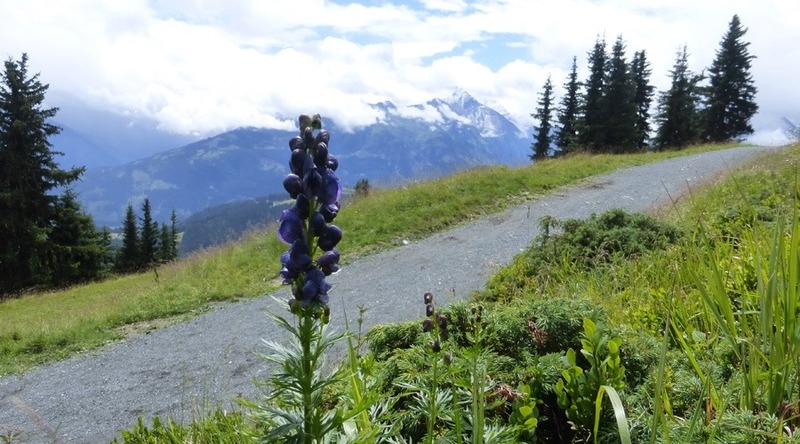 I also spotted some Common Monkshood framed against the backdrop of mountains. Reaching the Sonnkogel Bergrestaurant it was time for lunch and a refreshing pint. 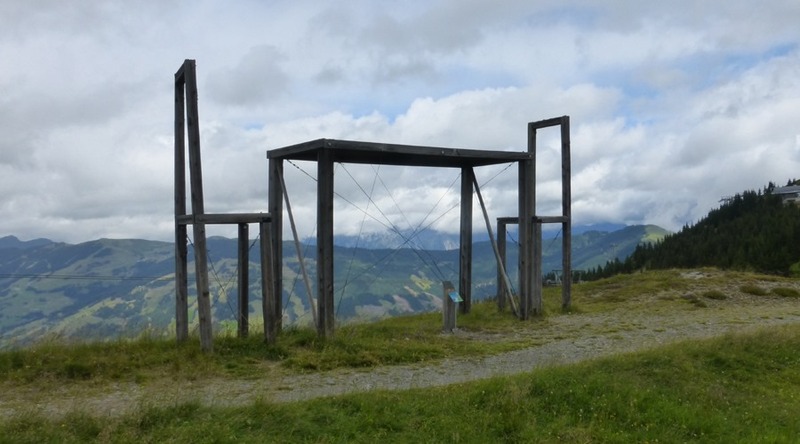 All that remained was to catch the Sonnkogelbahn chairlift down to the Berghotel and then the Sonneralmbahn cable car down to Zell am See. I just got back before it started to rain. It had been a satisfying high level walk to end my holiday. 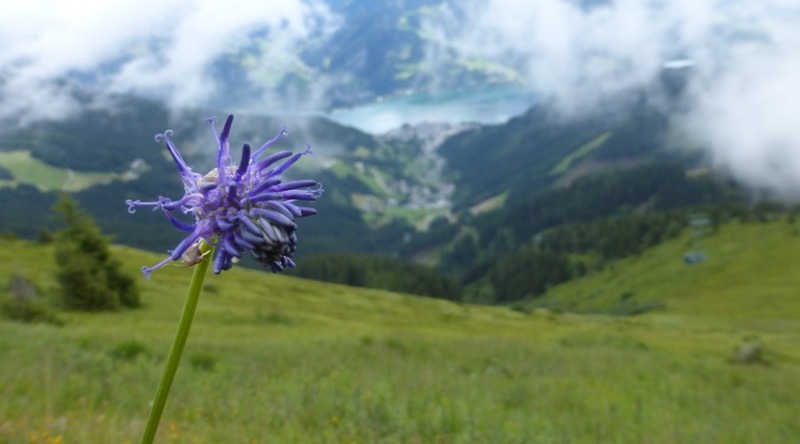 This entry was posted in Austria, Photography, Salzburger Land, Travel, Walks, Wild Flowers. Bookmark the permalink. Spent a couple of holidays in this area. wonderful views. That’s why we went back. Beautiful scenery.